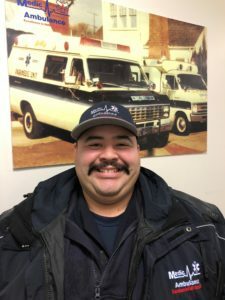 Dominic Romero has worked with Medic Ambulance for almost three years, and he is being honored as Medic Ambulance Solano Division 2018 EMT of the Year. He was also awarded Medic Ambulance’s 2018 Travis Grace “Excellence in EMS” Award and will receive a full-tuition scholarship for Paramedic school to Napa Valley College. Most recently, Dominic and his partner Gordon were an integral part of Medic’s response during the devastating Napa and Sonoma fires. They worked countless hours and were part of three different strike teams to the impacted areas. Dominic and Gordon helped in the evacuation of 65 patients from a Santa Rosa skilled nursing facility. Dominic has been a model employee at Medic Ambulance. He has provided excellent service to patients, and he has played an integral role in the company’s Quality Assurance Committee and Field Training Officer program. Dominic recently became a Critical Incident Stress Debriefing (CISD) leader within Medic’s new Caring for Ourselves and Others Affected by Critical Happenings and Everyday Stressors (COACHES) program, which helps employees remain mentally, physically, and emotionally healthy. COACHES is a peer-support team staffed by employees who have received specialized training in psychological first aid, traumatology, and critical incident stress debriefing.